Click here to watch the first video on how to connect with more prospective clients. In this video, I discuss how to make your next conversation about Reiki memorable -- in a good way! I also share the biggest mistake Reiki practitioners make when speaking to a new person about Reiki, and what you can do instead to help the person see how Reiki can help him or her. Pamela, truly as Reiki practioners, we have this gift of our experiences. The answer to any question about a specific outcome is the same: Reiki practice balances people, and each person responds according to her body’s own self-healing mechanisms, so we cannot predict specific outcomes for any individual at any time. That said, relaxation is one of the most commonly reported responses to Reiki practice, and there are research data to document that. Relaxation is an indication of the shift to parasympathetic nervous system dominance, which is the phase in which self-healing occurs. How Does Reiki Help lays out the physiologic response to Reiki practice in language meaningful to lay people and healthcare professionals. You can print it and offer it to your clients if you like. Thank you Pamela, all this is new to me but as I am meeting new people this week – I will keep all of this in mind. I always stumble over what to say to people and tend to try to back out of a conversation before it even starts. There is no way I could possible get any clients like this, so you’ve my mind to new possibilities. Thank you. Good luck, Tracey, and let us know how it goes. Thank you for these videos. I am moving towards reaching outside of my circle of friends and family with my practice and this is really helpful. I will admit I actually sometimes stumble the other way and instead of getting over enthusiastic I may not give enough information, I always talk about the relaxation part and for me I was introduced to reiki after I experienced head trauma from an accident involving a semi. My lovely friend gave me a session and I was amazed at how much more I got out of the experience than just the physical, it was truly an emotional and spiritual balancing. As we all know haha, but I am still just as amazed and grateful as when I laid down on her table that first time. But it was that initial care where someone reached out t me when I didn’t know how to express what I needed that prompted my own healing and journey. I have a real desire to work with trauma especially head trauma, bc I know how hard it was for me to communicate with people what I needed. I am still rather shy though and this reminder that speaking from your experiences is key was so nice to hear. I wrote down a very long list as well, and I loved your phrasing of “Everyday Improvements” I think that is a wonderful phrase that really speaks to the steady and constant stream of support that reiki brings us. No worries about not giving enough information, Mary. The person can ask if he wants to know more. The most important piece of information you can communicate is that you are knowledgeable and available. I agree with you about the value of Reiki treatment post head trauma. When the brain isn’t fully functioning, it is often very difficult to pinpoint that there’s something wrong, never mind communicate it. People just feel bad and confused, and we can help, but we have to make the connection first. I have recently taken voluntary redundancy and I am trying to pluck up courage to move from working on friends and family to doing Reiki one day a week on a professional basis. So the timing of your videos was perfect. Very good advice. Thank you Pamela. What came to mind wile listening to the video was the cereal commercial with Mikey ” try it you’ll like it”. Sometimes actions speak louder than words. I actually used this with a patient yesterday. I gave a short explanation that Reiki creates a relaxation response which in turn helps your body heal itself. Reiki can cause no harm so why experience a treatment and then decide. The patient who was very agitated and was experiencing a lot of pain, fell into a deep sleep during the treatment. I suggest saying, “Reiki evokes” rather than “creates.” The down-regulation of the nervous system happens within the body, is created by the body itself. Very helpful video. Now I have to rethink my answer to the question “What is Reiki”. But you are right, very few people are really interest in what is Reiki, they what to know how it can help. Thank you for new direction of thinking. with love and light , Debra . Thank you Pamela! Your suggestion to answer their question with the true question [what would you like help with] is so simplistic and is almost gauranteed to start a very free flowing conversation versus the stumbling explanation/deer in the head lights look that I’ve experienced one too many time. Thank you for your generousity. Pamela, I love your so simple and natural approach to client. That resonates with me as I automatically try to understand my client in similar way and help to open holdings inside of person. My passion is to give undivided attention and listen to what they want to share. I noticed that sometimes after expressing themselves by words they are more open for a session and another side of that -if we share our experiences they trust in us that we can help. Brilliant video. Thanks for reminding of our little improvements that make big deal in our life. I think this kind of approach makes it so much more focused on the person´s needs. Also will convey a greater willingness to give full attention to the person and this in itself can be very healing, since you are there for them in that moment, where it may be a little difficult for the client to talk about something they don´t know (and maybe don´t believe in). So, it´s showing them they matter to you and their well being is most important. Thank you Pamela. I’ve always had a hard time knowing where to start when asked about Reiki. I never thought of asking them what they need help with! I have given a close relative Reiki treatments before. However, we have had a period of stale mate and they refused anymore treatments because they were in a state of rejecting anything ‘ spiritual’. Recently I did a Reiki course in which we did lots of practice using Reiki energy. I said to my relative, I have a lot of energy exercises I could share with you that could help you with grounding yourself. They were up for it. Now I get, ‘can I have some Reiki on my head’. They describe the energy as nurturing and loving. I also practice a grounding exercise with them and then they ask for Reiki. It was a matter of finding the right words that met the needs of the relative rather than me trying to force upon them what I thought they needed!! Thank you for the excellent idea. I have been practicing Reiki since 1992 and have always launched into a long a detailed explanation of what Reiki is. It’s an excellent idea to just tell the person experiences I have had and seen in others. I guess you can teach an old dog new tricks!! Thank you for your comment, Deborah. It is so gratifying to empower other Reiki practitioners to improve their lives and take what we have to the world at large. Yes! It’s so simple, people do want to know if you can help them and as Reiki can help so many different aspects of life it is impossible to answer the question “What is Reiki?”. I’ve been asked the question countless times and my answers vary in length and intensity depending on the person, but it would be far more beneficial if whenever I am asked “What is Reiki?” I try and find out “How do you need help?” Thank you. Wonderful. I recently had someone ask me what Riki was. I fumbled over an answer. She and I belong to a walking group. Next time we meet I will try your suggestion and let you know how it went. This was an eye opener. Yes, please, Patricia, let me know how it goes. Thank you for this video series! I have got into a routine of describing Reiki to clinic clients as “gentle touch [demonstrating with one hand on the other arm], head to toe, avoiding sensitive areas”, with maybe a few words about deep relaxation. Then I ask, “do you have any particularly sensitive areas you want me to be careful around?” That elicits a pretty good description of the client’s most troublesome problem(s). Then I explain that Reiki is holistic, thus I treat their whole body, which can make the problem area feel better. That’s with people who’ve already decided to try a treatment. With prospective clients, at the clinic or at a wellness fair for example, I just demonstrate the gentle touch part and talk a little about deep relaxation. I might ask, “what’s bothering you today?” and then they are happy to describe it in detail. Listening attentively and smiling reassuringly to their story builds trust. “Would you like to try a treatment, to see if it helps?” I ask. Very often the answer is yes — unless I start going on and on enthusiastically – in which case the potential client will start to look for a way to gracefully escape my Reiki clutches. The listening part is key — and also makes it much easier for me, because then it’s a conversation and not a sales pitch. It was most auspicious that we were starting the clinic around the same time that we invited Pamela to come give a well-attended talk on Communicating Reiki in our area. We tried her suggestions and began to see more people try our services. I am thinking that reviewing our routine, and thinking about other question that might be good to ask, will be a great way to bring what we are doing to the next level. Thank you for sharing your excellent ideas, Jeffrey! Most of the reiki I offer is in various departments of my local hospital, Middlesex Hospital, particularly in the Center for Joint Replacement and on the Hospice Unit. I so appreciate your videos…I’m frequently asked by patients what reiki is, but have never thought to gently ask them if they have specific emotional needs, turning the question around. (I usually mention reiki’s encouragement of relaxation and the lowering of pain thresholds…possible areas of physical relief.) I intend to take your advice and put myself in the patient’s position more often! Thanks again. I look forward to watching your video tomorrow! What great work you are doing, Carolyn! I wouldn’t ask if they have emotional needs. That can sound invasive. But you could ask a more open-ended question, such as is there anything they would like support for. I appreciate the first video and I am doing most everything you suggested. this help to affirm I am going about increasing my client base in the right way. A couple of weeks ago I took you suggestion without knowing you were going to make it to write down experiences I have had giving Reiki. I have hesitated to talk about them as some of the experiences seem beyond logic or perhaps boastful However, there are many experiences which seem everyday and ordinary which touch peoples lives in such a way that they may be helpful to others. I plan to use what seems to address the clients needs. By saying how Reiki has changed my left seems to me to be the most useful thing to place in a potential clients mind. I do have references now and they have agreed to be available for someone considering Reiki from me. Thank you. I love the distinction you made between what the client is asking and what they really want to know, and to answer from my own experience with my own personal practice. Thank you! ? I too wish to thank you for these video clips Pamela. They’re helpful! In the first clip I liked the idea of forming a network with other health care professionals. I’m starting to do that now. I have learned from you the importance of listening deeply to what a person is saying when they inquire about Reiki. “Can Reiki help me?” or a loved one is usually what it is about. My list of actual experiences that I wrote here will help me to match the need of my client with what I have observed. This makes great sense and I thank you for bringing it forward. 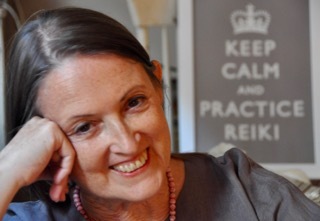 Thanks, Pamela, for the profound, authentic, yet simple to use information for sharing Reiki. I think when Reiki became an every day part of my life, I forgot what brought me to Reiki and what keeps me with Reiki. Writing it out helps a lot with the remembering. Thank you Pamela, asking the clients their needs are key!! I love success stories. Thank you for this series of videos Pamela. I’m new to practicing Reiki First Degree. I practice self-Reiki every day. I practice on students in Urban Zen Classes. And I occasionally practice on one client in private sessions. You are right. As Plato says “we are all fighting a war”. Everyone we come across can be benefitted by Reiki. And most people, once they feel that I am listening, will want to talk about their need at the moment. Many of my clients, friends, and family, are now lining up to become attuned to First Degree so that they can continue receiving the benefits of Reiki every day as I do. It sometimes takes me a while to remember to open my ears and my heart, before opening my mouth and my mind. So thank you for this very helpful reminder. And for your continued generosity in educating us and supporting us as we build our Reiki practice. Pamela, this is perfect timing. I am hosting a Free Reiki clinic at one of the local health food stores. I am offering 10minute chair samples. I will definitely try this approach. My chiropractor who I have my Reiki Practice with said that people want to hear stories. As you know I have plenty of them. This will definitely be helpful. I also have a new supply of brochures. I made the changes you suggested. I think it makes more sense to see what people are looking for. I myself have found that people are interested in hearing about Reiki but are unsure wether or not they want to commit to a treatment. They will definitely allow a free sample. You are right! I always started telling people what Reiki was, and they lost interest almost immediately. It makes so much sense to approach their questions from the vantage of what their need is. Why did that never occur to me? The list I made has more on it that I thought it would, and some of the entries are pretty impressive. Very helpful video clip. For the first time I listen and stop the video and write down what Reiki practice did for me the list is long. Never thought to make a list and towards the end I start – ” surprise” free writing and I knew that part is only for me but was so much fun. Thank you for this I needed to acknowledge in writing an open ended list of my practice. Question remain to whom I practice this except you.